So long housewife, hello blog wife! So you’re a mom and wondering how to start a mom blog? You’re in the right place for starters! I’m so happy that you’ve landed on my article where you can learn how to create a successful mom blog easily and quickly. I wrote this article because I know as a mom, working or housewife, you don’t have all the time in the world, well barely any actually. So getting things done quickly and efficiently is what this article is based upon. The bonus? You don’t have to be a tech whiz to start a mom blog. Just follow this article and you’ll be good to go. When I set up my blog, about 10 years ago, there wasn’t much information out there. So, I’ve compiled a list of 6 steps I wish I had when I first started which will help you get started and give you that amazing sense of accomplishment when you’re all set up! Hey mama! If you want to create a successful mom blog and make money then you need to get started on the right foot and avoid those easy-to-make mistakes. Therefore, your initial set up needs to be done correctly. So let’s dive right in and check out what takes to build a successful blog! First, Why Even Start A Mom Blog? Before we get into the 6 steps, I just wanted to point out the lovely benefits of starting your very own blog. So many people I speak to say “what would I even write about? I’m not that special”. The truth is everyone has something to offer, if it is being a stay-at-home mom- you have something special, you can help someone or many people out there. The world needs that unique gift only you have- so don’t let anything get in your way. There are so many successful mom blogs out there, you could have one too so soon! · Share Your Story: you have something special to share with someone. Even if you’re life isn’t all that eventful, nowadays people want to know anything and everything. There are people packing for their holidays online, talking about how to organize their house, you name it, it’s there! So, don’t worry about not getting readers because your life isn’t interesting enough, in fact, the more relatable you are, the better it is. Plus, being a mom is probably the most interesting thing you can be, you have a big window as a mommy! · Make Money From Home: Ever dreamed of that life where you drop the kids to school then go home, get in your comfy clothes and make money online by doing something you love? Well, then a blog is definitely for you. The more readers you get, the more money you’ll earn. You can even expand your blog by selling certain products that you love through Amazon or affiliate programs – the sky’s the limit. And if you’re really popular, companies will pay you to promote their products. Plus, it’s perfect if you have really young children, you can stay at home and be at work simultaneously. Win-win! · Expose Your Existing Business: If you already have a business, a blog is great to build a large audience for very little cost, therefore, your potential customers can know you on a personal level and get to know your brand. · Become an Author: If you’re aspiring to become a published author, there’s no better place than starting an online blog where you can tell professionals to check out your work. · Write as a Release: Write as a hobby or write as a therapeutic release from your hectic life. It’s a really healthy way to express yourself and it will touch or inspire others! Plus, creating a blog site is extremely cheap so you don’t have to really invest in this exciting, rewarding hobby. Boy, if someone reads your post and enjoys it, you’ll feel an overwhelming sense of pride, trust me! Did you relate to any of those points above? Can you now see how powerful a blog can be? Yess? Yay, let’s get you up, running and ready, successfully! 6 Simple Steps to Setting Up A Blog! I’ll guide you all the way through on how to start a mom blog and become a successful blogger, just sit back in your chair/sofa/bed (grab a coffee) and let’s go! 1. What to blog about? 6. Personalize your site and start blogging! Piece of cake? It is! If you’re already part of a company or own your business, then this part is super easy. Just blog about the niche your company is in and the products that come with it. However, if you’re an individual looking to set up a personal blog then you have a lot of freedom. But freedom can often lead to confusion. The world is your oyster in this respect but here are the top 3 tips to use when deciding on what to blog about. 1. Be knowledgeable in the topic: I’m not saying you should have a Master’s degree on the topic but at least be knowledgeable about whatever you’re writing about. I know this sounds really obvious, but you want to be known as an authority figure- that go-to person for this topic. 2. Enjoy the niche you have chosen: Again, kind of obvious but still I’ve seen people fall into the trap of choosing a topic which is popular and not what they actually enjoy. If you’re a woman and think that you can only blog about cooking, WRONG. You can blog about soccer, politics or beer yoga, if that’s your thing! Write about something you love, the more you stand out, the better. 3. A topic that can be discussed: You want to keep your blog as interesting as possible to keep it alive. Make sure there are plenty of angles to explore and a lot to talk about. As you’re probably a mom reading this, you are sort of already in a niche! As a mother, you’ve accumulated a very particular set of skills (yes, a Liam Neeson reference!) putting you up there in the superhero category. Moms are taking the online blogging world by storm because of their priceless funny mom stories and invaluable advice. 1. Practical advice: i.e. how to pack a healthier lunch for your kids, twice the speed. As you’re a mom, A.K.A a “shero”, then you have acquired some super powers on getting mundane tasks done quickly and efficiently. You can even delve into how to manage behavior? Lessen family squabbles? Share that power and knowledge with other moms! 2. Help for new mommies: if you’re an experienced mom, why not pass some of your mama wisdom on to new mothers who are struggling with new born babies and toddlers. 3.How to be a yummy mommy: being a mom can take its toll on your skin, body and mind. But are you fighting back? Working out and eating clean? Then show other moms it’s possible to be healthy and hot at any age, no matter the number of kids. Teach moms to pass on healthy habits to their children too. Happy mom, happy home. 4. Funny mom blogs: if you fancy yourself as a bit of comic, then blog about how weird and wonderful it is to be a parent. Because kids keep you young and laughing after all! Consider what makes you unique as a MOM then hone in on that idea- are you a single mom? A divorced mom? A soccer mom? A young mom? An older mom? There are so many ideas out there for you mama! The goal of any blog is to specialize in a topic or niche so you become an authority in that field. So, have a think then move on to step 2. It may be tempting to pick a free platform to start blogging, but let me just tell you, it’s a waste of time. Using a site where you have to pay a little (very little) to get a good base for your blog is highly recommended. No question about it. Best Platform to Use In 2018? It still remains that WordPress is the best platform to use and by far the most popular. Due to its mammoth popularity, there is a huge community of users and programmers contributing to it and a lot of help out there if you have any issues. 1. Hosted: WordPress blogs often called “WordPress.com blogs.” I recommend this one as it gives you more peace of mind. It costs a little bit of money but it’s way better. Remember the costs are very small. Please bear in mind, the rest of the steps will guide you on how to start a Hosted WordPress blog. A Self-hosted WordPress blog would require other steps. I also recommend reading Rosalind Gardner's "Affiliate Blo﻿gger Pro" on How To Make Money once you setup your blog through my instructions. I'm a massive fan of her and quite possibly could write another blog post about making money through blogging in the near future, but for now, Check out her awesome work, here. 1. A web host or a web hosting service provider provides the technologies and services you need for your site to be viewed on the internet so others can find your site. The web host I have been using for over 10 years is Bluehost which is one of the most popular hosts available. There are others out there but Bluehost is super affordable, quick, easy to use and has an impeccable performance. No wonder it has an extremely high customer satisfaction rating. Are you ready to start creating your blogging site? Click here or the image below to get started! You can refer back to the instructions on the site as you read the steps in this blog. Once you’ve clicked on the link, you’ll be taken to the Bluehost site. Click on “get started now”. Right now I have a prime account because there are amazing unlimited options. As you can see the prices are super affordable. Even on the basic plan, you get good features for your buck. What’s really great, is that all plans have a free domain name lasting for 1 year. Your domain name is your web address so “mywebsite.com” – but I’ll get into that in the next step. If you’re on a shoestring budget (and I’ve been there, I know how it feels but it’s so worth it) then choose the basic plan. You can upgrade whenever you like. If you haven’t done so yet, select a plan and let’s move on to step 4. If You want to brainstorm and see if your carefully selected Domain name is available, you could check right here. So after you’ve selected a plan (step 3), you’ll be taken to this page. 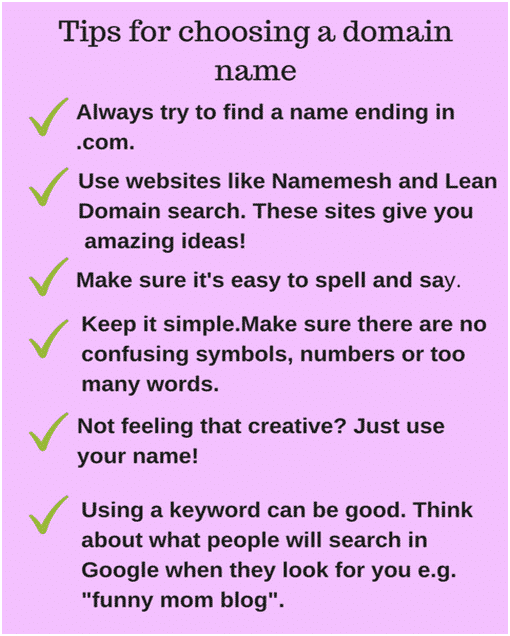 On the left you can enter your brand new domain name (see my tips for coming up with a domain name below), just make sure you remember the extension part (.com/.org etc- on the drop list next to it) and choose one that you like. For people who are one step ahead of the game, you can go ahead and type your existing domain in the box on the right. Don’t worry, this won’t interfere with anything if you’re using the domain somewhere else, this is only for identifying the account. For now. We will discuss this further in step 5. For the sake of this article, I will enter a new domain name. However, if you already have one you can still follow the steps. You will only notice minor differences in options but that’s it! Just fill in your info and use a working email address as all your login information will be sent there. As you can see above you can select an account plan. Base your choice on how far in advance you want to pay. Select an account plan and voila! As you can see the price works out to be a very affordable monthly amount. And for your own blog that can make you richer (money wise and personally), it’s a no brainer! The total is the amount you’ll pay now. Then you won’t be billed again for another 12, 14, or 36 months depending on the account plan you choose. Should I opt for extras? I always select the Domain Privacy Protection as an extra. This is to ensure all your private details linked your domain (like your home address etc) remains strictly private. You will already get this add-on if you chose a prime package. However, I would skip this part if I were entering a domain name through a business where I didn’t mind people being able to the see the address of the company etc. But I really recommend it if you’re an individual setting up a blog. Apart from that, I don’t add any other extras. Note: if you transferred an existing domain name, this feature will not be available as you would have got this feature when you registered your domain name initially. Enter your billing info, confirm that you’ve read the terms and conditions then hit submit! You’ll be asked if you want any upgrades, just whizz past them and continue to complete your order. Well done for getting this far, you’ve completed your purchase and now you’ll get a welcome email from Bluehost. It’ll provide your login details to your Bluehost control panel (they call it cpanel). Keep this info, you’ll be needing it! Before you can log into your account, you need to choose a secure password. Note this account contains your payment information so please don't choose easy to guess passwords like "1234"! You'd be surprised how many people do. Well done for getting this far, you’ve completed your purchase and selected a password and now you can login to your account to setup your WordPress site. Once you click on login, you'll be able to select a theme for your wordpress blog. I hope it’s been relatively simple up until now. This next part is super simple to follow. Just select choose whether you'll be using your site as a personal site or business site. You will get a window like this then simply click Continue Installation to begin the installment. For now, your site will just say "Coming Soon". To launch your site, simply click on launch site and you'll be brought to the next screen where you choose your site name. Site name is different to your domain name as it won’t end in .com (or something similar). For example “Anna Cooks” or “Sally’s Funny Mom Blog”. After launching, you'll login to Bluerock panel. Before you login to WordPress, you will choose an admin name (please don’t choose the word “admin”) and then create a password. These will be your login credentials for WordPress once it’s installed. Enter your email address and all your login details will be sent there (just like Bluehost). Read the terms and conditions then complete your WordPress installation process. I have like zillion passwords and I’m sure you do too. You should have received 2 emails by now, one with your Bluehost login details and one with your WordPress login, keep those emails safe or make note of those credentials somewhere. Congrats! Now anyone including yourself can search your URL and find your spanking new site! Clicking on the site URL on the WordPress email will also take you to your live website. By clicking on the login URL, it will take you to the login page of WordPress where you can log in and start using your site. As of yet, your domain will not be displayed on your new site. You will have to change your name servers wherever your domain is registered at the moment, only then will your new site be displayed. Changing your domain servers points your domain to your new site (if this sounds confuzzling, I’ll explain this process below). · IMPORTANT: Only change name servers when your new site is all set up and ready. You can still access your new site via a temporary URL which would have been provided in the Bluehost welcome email. If not, give them a quick call and ask for one- just say you need a temporary URL for your new site! 2. Go to the registrar where you registered your domain name initially (Namecheap, GoDaddy, Google domains etc). Enter the information above in the right place. If it’s not very clear just give them a call. Check out this Bluehost link (https://my.bluehost.com/cgi/help/432 ) which will give you links to the most popular registrars. Right now, whether you entered a new or existing domain, you should be able to type in the URL into any browser and find your new website. If not, please check you did the steps correctly. If so, let’s move on to the final step before you start making money online as a blogger! 6.Personalize Your Site and Start Blogging! Here is where you can get creative and build a site you love by picking a theme, deciding on a layout, choosing colors and fonts- you name it. WordPress will walk you through making your site pretty. Plus, there are so many videos out there on YouTube or Pinterest for amazing blog site ideas. This article was all about how to create and start a mom blog, getting you up and running quickly and successfully and making sure you didn’t make any easy-to-make mistakes. Hopefully, you are ready!